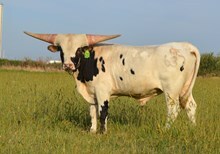 Huge horned cow that will stop your ranch guests dead in their tracks! Measured 74 1/2" in Nov 2018. If you're looking to add base to your program, she will do it! Bull calf at side sired by JH Sahib (JH Rurally Screwed x JH Rita's Ringer). Check out the hip on him!